When I have written about tsuki in the past it has usually been to describe it as a technique that is seen occasionally at “All Japan” level, but never widely practised. I am now starting to change my opinion. I am trying to get over a dose of “man-flu” so did not get to see yesterday’s British Open’s, however during my visit to the previous week’s Swedish National Championship I saw three good tsuki scored. This seems to be part of a trend. There are an increasing number of European kendoka who are adding tsuki to their list of tokui-waza. Whether this is because we are seeing more players take up jodan and nito or because we are generally becoming aware that it is one of the four basic techniques of kendo, I am not sure. My own pet theory is that the current popularity of tsuki owes much to Naoki Eiga’s decisive point in the team final of the 12 WKC. However when considering that this happened almost 12 years ago, some of the kenshi now successfully using the technique in shiai, were in junior school at the time, so Eiga san’s tsuki must have left its mark on kendo’s collective consciousness. 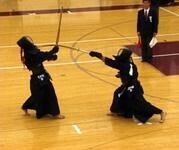 I include both single and one handed tsuki in kihon drills. Obviously it requires a degree of care when practising, particularly from newer kenshi, but doing tsuki safely and successfully is as much the responsibility of motodachi as kakarite. If motodachi is afraid of receiving tsuki, the chances are that kakarite will miss the target. If motodachi leans back or twists his body away from the tip of the shinai it is highly likely that it will slip in by the side of the tsukidate, grazing his neck or worse. If he tilts his head back, then there is a strong probability that the kisaki will go up and under the protector, causing even greater discomfort. The way to meet tsuki is full on, with your body square to your opponent and your chin down, so that there is no gap between the tsukidate and the dou mune. Posture is also important. If you are erect with your balance centred in your hips and core, then the strongest tsuki should not disturb your equilibrium. For the attacker tsuki should be short and sharp, made with the body and the feet and with the hands applying tenouchi correctly at the point of contact. I aim to do lots of tsuki drills over the next few months to help understand the technique as a player and as a referee. The best advice I’ve ever received regarding tsuki (or tsirum as we call it) was to lift the shinai tip up, and push down into the tsuki. For some reason, that really helped me with my accuracy. We don’t practice it often enough IMO in my dojang, but that little tidbit helped me improve my technique. YMMV.